Unseen treasures with mysterious names beckon from the depths of the ocean: manganese nodules, cobalt crusts, black smokers. Hidden within them are rich concentrations of valuable metals. On average, each and every one of us consumers will use two metric tons of copper and 700 kilograms of zinc in our lifetimes. A single smartphone contains 30 different metals. 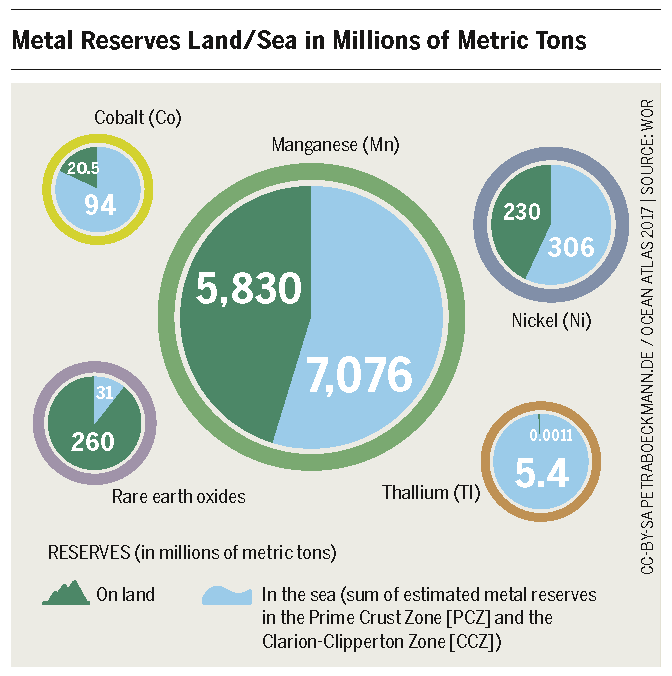 Among them are cobalt and rare earth metals mined on land under questionable circumstances. And now talk has turned to the need for deep sea mining. Are the reserves on dry land already exhausted? One might think so. After all, we’ve been mining for centuries and the global demand for raw materials has risen rapidly in that time. 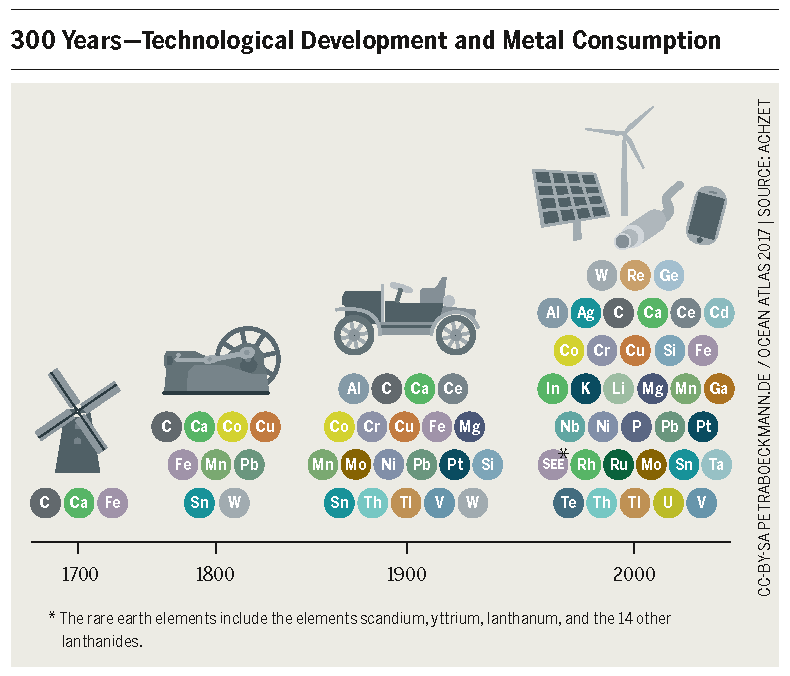 Automobiles, IT, renewable energy – we need enormous quantities of metal for each. For example, a single wind power turbine contains 500 kilograms of nickel, 1,000 kilograms of copper, and 1,000 kilograms of rare earth metals. But there is no geological shortage of metals – there are actually more than enough in the ground. So why is the interest in deep-sea mining so great? Because it is becoming more expensive and more difficult to meet our needs using the means available on land. Mining yields resources at the cost of substantial environmental damage – and fewer and fewer societies are prepared to pay the price. 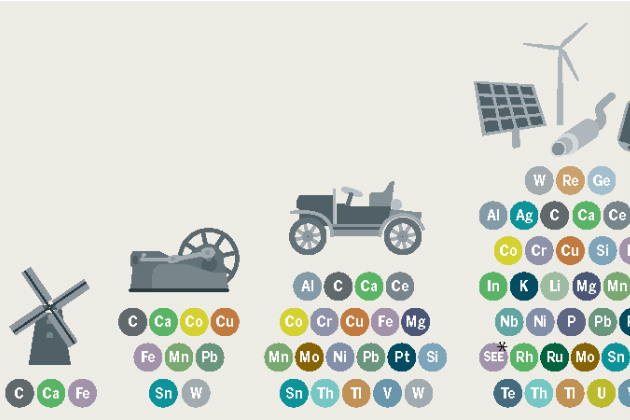 For instance, rare earth metals are not rare at all, all things considered. They are only “rare” because mining them is too expensive due to high labor costs and environmental considerations. That is the only reason that 97 percent of the supply currently comes from China. It really is economic reasons above all that have sent the Western industrialized nations searching for new sources of these valuable metals. For example, 40 percent of global cobalt production comes from the Democratic Republic of Congo, a country once wracked by civil war. It is still suffering from widespread corruption, in which the struggle for raw materials is often a bloody one. The European Commission ranks cobalt as “critical” – not because it is concerned about human rights but because the regional concentration makes the supply for the European industry insecure. What could be better than dipping into the treasure chest of the deep sea? It is one of the few parts of the globe that has not been parceled out and exploited. Only about 10 percent has been surveyed topographically and less than one percent has actually been researched and explored. Here’s what we do know: the deep sea is a habitat in which everything – everything – happens very, very slowly. The tracks made by equipment from the first expeditions to the sea floor in the 1980s are still visible even now, as though they were just made yesterday. It takes a million years for manganese nodules, the valuable metal nuggets on the ocean floor, to grow just 5–20 millimeters. Ecologists warn that anything that is destroyed there will not regenerate for a long time, if at all. Before proceeding with extraction we need to gather more knowledge about the effects it will have on the deep-sea ecosystem. But a number of countries and industrial companies are already chomping at the bit, eager to secure what they see as their piece of the cake. Germany is the proud owner of an ocean floor claim near Hawaii about the size of Ireland. A couple of nautical hours northwest is Belgian territory; a South Korean stake is right next door. French and Russian claims are not far away, and to the west one finds Chinese territory thousands of kilometers from the mainland. According to the UN Convention on the Law of the Sea, activities on the high seas should serve all of humanity and not be possible only for industrialized nations. The International Seabed Authority, or ISA, has thus ruled that deposits of valuable raw materials must remain reserved for developing nations; it also acts on behalf of environmental protection in the ocean. Thus, large areas of the claims must be spared for protecting the ocean floor. The ISA is currently preparing regulations for the extraction of manganese nodules. It will be the first time in history that a clear division of raw materials was created before extraction began. Despite all these concerns, commercial deep-sea mining is set to begin in the next few years. Not, however, in internationally regulated areas like the Clarion-Clipperton Zone, but rather in the exclusive economic zones of countries like Tonga and Papua New Guinea. International rules do not apply there and they alone decide on rules and environmental standards. The island nations are ready to take great risks in the hope of securing development opportunities and licensing profits. But like the ecological results, the sociological effects of massive disruptions of the fisheries, or tourism, or pollution of the ocean are difficult to predict. For this reason, thousands of inhabitants of Papua New Guinea and other South Sea islands have publicly protested against these plans since 2008. While these protests have hardly reached the global public, they have found solidarity with a whole range of international civil society organizations that are demanding a stop to all projects aimed at the extraction of mineral resources from the deep sea. 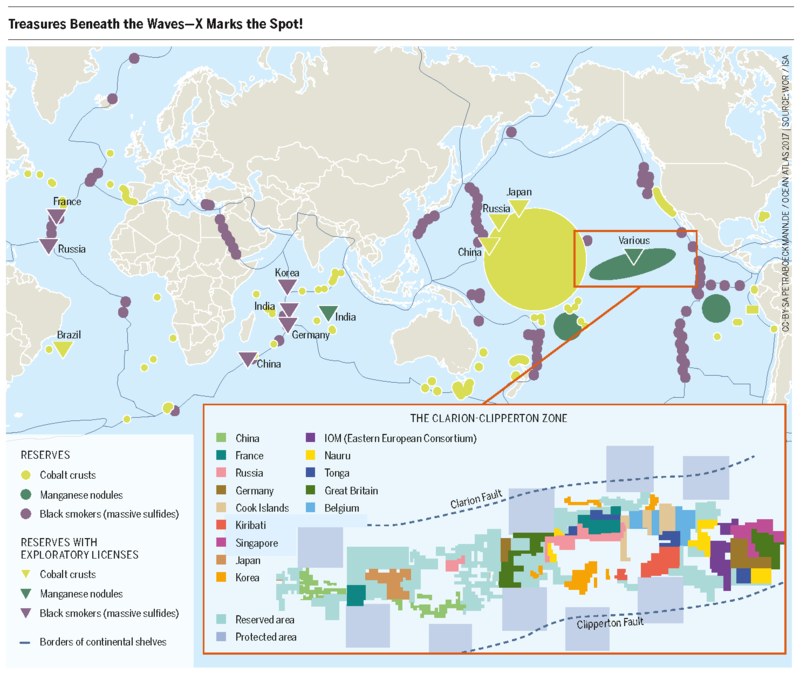 Infographic from the Ocean Atlas – Treasures Beneath the Waves – X Marks the Spot! Flooding, erosion, sinking: our coasts are under ever-increasing pressure. People who live in coastal regions are especially endangered – and there are an ever-increasing number of them. Energy From the Ocean: Where Does the Future Lie? Countries are turning their attention to the ocean in order to ensure that future demands for energy and raw materials can be met. Which direction will they take? What are the opportunities and risks? An overview.